There was a block of houses, all white and modern and lovely, being built in our neighbourhood close to our apartment. I passed by everyday, thinking to myself how beautiful they were and how, if one day I ever get to build a house of my own, I’d love to have one just like those. The construction on the houses was finally complete a few months back, a ‘for rent’ sign was put over them for a few days, and then the tragic transformation began. Apparently some new “nursery” decided to rent the entire block of houses except one. They have surrounded the multiple parking of the houses with a high fence, grey bars dotted with colourful circles, put up a metal canopy to shade the surrounded area transforming it from a parking space to a play area, less than a meter away from the road where the cars and the fumes are. The facade of the lovely modern buildings is of course obstructed by the make-shift play area and now there is a huge glowing sign announcing that it’s a big nursery. The fifth nursery to open up right next door to the house where my rented apartment is in the past year. Why do we need so many nurseries in such little space? Do we really have that many children that need to go to nurseries and there aren’t enough space? Is there any justification why, in one block of houses, there are five nurseries each within a five-minute walk from each other? What’s my take? Those nurseries cause traffic, the one right next door to me is very noisy, people dropping and picking up their children always block my path and sometimes take my own precious shaded parking. Not only they operate in the morning till afternoon, they are used in the evening as classrooms for anything and everything: religious teachings, arts and crafts, school subject revisions, etc. which means the crowds, of the five different nurseries, are always there blocking entrance and causing noise and unwanted traffic. Most importantly, they look ugly! How ugly? Some nurseries are so ugly you feel your eyes hurt and you cringe as you look at the once beautiful house wrecked into a childish. A child wouldn’t care if the building he went into was painted flubber-green with fluorescent yellow polka dots and electric blue stripes. Passers by, people who built houses and paid fortunes to make them look presentable, people who look out their window day and night, people who sit in gardens to enjoy a cup of tea in the peace and quite care. 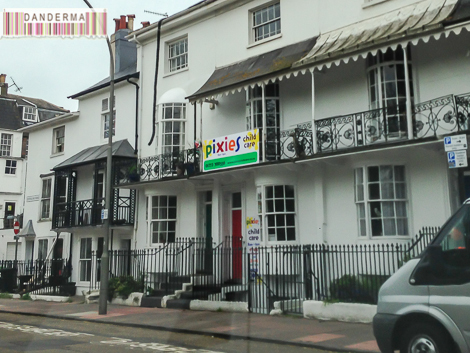 The picture at the very top of this post is a picture of a nursery in Brighton, UK. Do you see anything remotely resembling a circus? No. Do the children of Brighton feel less happy than the children of Kuwait because their nursery is not painted like a rainbow with barn animals drawn all over it? No. Had we not been standing at a stop sign and I was gazing at the house I wouldn’t have noticed it was a nursery, or a day care at all. Plus, there was only one in many, many blocks and streets I’ve passed by. Even in Dubai, the nurseries look presentable and are distributed logically. I’ve long given up on nurseries that don’t scare people off, I can look away and live with that. I cannot live with five nurseries crowding the street surrounding where I live, five that I can see in one single block with an actual government kindergarten in the middle. There should be some law limiting the number of nurseries to at most one per block in one area, two at most if the block is really large. This is ridiculous and like everything around here, seems to be getting out of hand since there is no guarantee a sixth, seventh, even a tenth nursery would open up soon to join the neighbourhood of nurseries in the area. What do you think? How many nurseries are in your area and surrounding where you live? Eek poor you! And you know 80% of these house nurseries aren’t even registered ya3ni running illegally and robbing parents off money and providing zero education in return !!! They aren’t? So they are just operating like that with no one to stop them? I know one of the neighbouring nurseries had decided to build an extension to their building and they proceeded without anyone’s consent, including that of the building’s owner! I wonder why no body is doing anything to stop them.